← What is That Smell Coming from My Drain? It’s true, there are plumbing fixes that can be done at home without calling out a plumber. No one wants to call the plumber out only to find out it was an easy fix that they could have resolved by replacing a simple worn out rubber gasket that costs twenty cents from the hardware store. 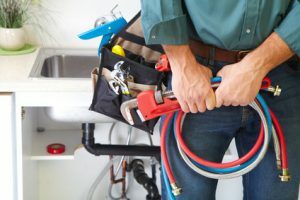 There are some times when there shouldn’t be a question in your mind as to whether or not to call your Melbourne, FL plumber. These are some of the times it is always best to call the professional. Whether you are finishing your basement or adding another section on to the house, it is always the right thing to do to call a professional Melbourne area plumber. There are codes that need to be kept for your safety and should you decide to sell the home in the future, these codes need to be kept in order to pass inspection. Permits are also a common need and the professional plumber will know what needs the permit and what doesn’t. If a sewer line bursts, the county needs to know about it. Depending on whose shoulders the burden of repair falls, a professional will be required to handle all sewer repairs. Even leaks will need to be properly evaluated to ensure there isn’t a larger problem brewing. The last thing anyone wants is sewage backing up in their home or yard. Leave it to the professionals to quickly and effectively deal with the problem. Aside from flushing good bacteria every month, all other septic maintenance needs to be completed by a professional who knows what to look for and can properly dispose of the waste material. Septic systems are expensive to replace and if you don’t know what to look for can be complex (and costly) to troubleshoot. Your hot water heater is a major appliance with just as major consequences if something goes the slightest bit awry. There are just too many opportunities for something to go wrong. Even with the best DIY tutorial you could be costing yourself additional money in the long run. Sometimes there just isn’t enough time to do-it-yourself. Calling a plumber is not a sign of incompetence. Even plumbers call plumbers from time to time. So, if you aren’t sure of what to do, or just don’t feel like doing it, call your Melbourne area plumber.